CANE GARDEN BAY, Tortola, VI - It started yesterday Tuesday, February 5, 2019, a sea defence wall under construction in the area adjacent to the Cane Garden Bay beach. 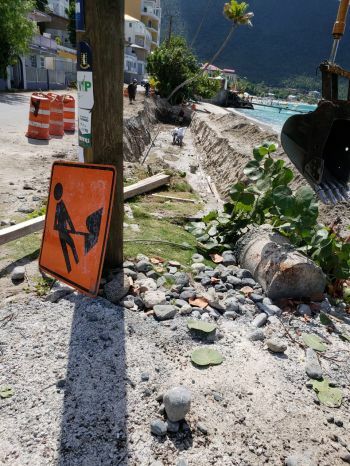 It is believed that the wall project is being paid for by the Organization of Eastern Caribbean States (OECS), and it was engineered by consultants as part of a Sea Defence Project. A call to the Ministry of Natural Resources and Labour and the Town and Country Planning Department resulted in both agencies claiming they cannot find approval for the project. Further, a call to the Public Works Department—to ask if they were supervising the project—was not returned. Acting Director of the Department, Mr G. Navarro Donovan promised to text our newsroom, but up to publication time has not. Residents have started to call our news centre, and other government officials along with relevant departments with questions about the project and the environmental wisdom of it and whether the intention to prevent erosion will be achieved. A call to Hon Melvin M. Turnbull the second district representative was not immediately returned. How can a project be awarded and started without the MoF certifying that funds are available to fund the project? Don’t TCP, environmental agency, PWD/Engineering... ...etc have to also sign off on a project? Even if the project were funded by the OECS, the Premier/MoF should have brought the funds to the HOA for acceptance so that the funds can be accounted for. It is this attitude of people not following the rules is how we got the ESHS Wall fiasco. Let’s follow the da...n rules. This area needs a strong, durable and effective seawall to protect the shoreline against ground swell, storm surge......etc. The area also needs wave calming devices to dissipate the wave energy to dampen the wave force before they crash along the shoreline. Is this sea defence project a temporary, pre-election project? What is the scope of the project? What is the cost? By the way, Pop needs to refer ??? to the MoF, for he is just the contractor. On another note, noticed nuff road projects springing up. The MCW says that road work has nothing to do with the election and they were planned for after the rainy season, which runs from June to Nov. Road work can be done during the rainy season by planning work based on the weather forecast from the Antigua Met Office and other sources? Per the MCW, the road work is only temporary fixes, not full depth repair/reconstruction. These skin patches (sealcoat, overlay) surely can be done in the rainy season based on weather projection; both temporary and permanent road work are planned using weather forecast. Why the road work could not have started on day 1 of the 1460 day term? Why is the work occuring on day 1441? Stop playing mind games with us; stop pi..g on us and telling us it is raining. The Road Dog will seek out the road inconsistencies and illogical pronouncements and pi...s on them. I am a bit concerned with this project. Was there a study to this project outlining what possible ramifications might exist from this work. Why wasn't the people notified of this project or even made mention of it during the Representative many campaign launches. The Representative had to know something and the nerve that he started right in front of his house makes it even more questionable. This will in-fact affect our home at the other side of the beach and the rest of the beach which is already posing some concerns with the lengthy removal of sand from our shores that is replaced by rocks. For about 7-8 months these rocks has been present and never left. We remember the times when the ground sea would come up, the rocks would be present or evident for a few days but after a week or so, our beach would be back to normal. Now, CGB beach is not like before and it raise a concern that the whole beach will in fact be affected by these rocks. We will no longer have a beach CGB residents. We have never seen the influx of so many rocks before and we have to do something. This nonsense have to stop! We continue to do things for the love of money and neglect the bare natural necessities we can live by. I am appealing to the Governor please look into this matter. We cannot lose the beach through monetary enrichments. So why they didn’t start from the other end first. Seeing that they don’t do anything for the people on that end of the beach. Also there a family whose home is very much in need of protection from the the eurision of the sea swells. Whom they turned a blind eye at. Isn’t it a part of the 2 nd district or cane garden bay? MITCH WE NEED BATHROOMS AND A FERRY PORT FROM JOST.DWAAAAAAAA!!!!!!!!!!! !